Basic income is the concept of regular, unconditional payments made to all citizens, regardless of whether they are employed or seeking work. 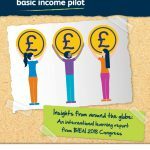 This new report, written by the Scottish Basic Income Steering Group, highlights learning from basic income pilots underway or in planning in Finland, Ontario and the Netherlands, compiled from discussions with representatives at the Basic Income Earth Network 2018 World Congress. It sets out key questions to be addressed to pave the way for a successful basic income pilot in Scotland.